Esri Press' two most recent publications describe contemporary applications of GIS to both map design and the study of history. From the beautiful cartographic examples presented in Designed Maps: A Sourcebook for GIS Users to the intriguing cases analyzed in Placing History: How Maps, Spatial Data, and GIS Are Changing Historical Scholarship, Esri Press offers something for professors, students, and GIS professionals to enjoy. The sequel to the highly successful Designing Better Maps: A Guide for GIS Users, Cynthia A. Brewer's Designed Maps gives a graphics-intensive presentation of map design for both the experienced and inexperienced user. Each chapter characterizes a common design choice readers can employ in their own design decisions. Each chapter includes a demonstration map annotated with specific information about fonts, styles, colors, or patterns used to produce the design; an index explaining the ArcGIS 9 tools used to accomplish the cartographic effects; and additional tips for seasoned ArcGIS users. ISBN: 9781589481602, 220 pp., $39.95. 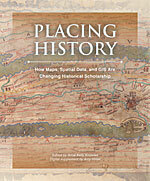 Placing History: How Maps, Spatial Data, and GIS Are Changing Historical Scholarship presents case studies and essays on key issues involving historical GIS, a promising new methodology for studying the past using GIS software and allied geospatial methods. This modern approach is nothing short of revolutionary, as few scholars or students made maps even 10 years ago. Included with the book is a supplemental CD that includes PowerPoint presentations, videos, map layers, GIS projects, and ArcExplorerJava Edition for Education software to provide readers with an interactive experience. Placing History helps bring the past to life in case studies for events such as the Dust Bowl and the battle of Gettysburg and aims to inspire academics and professionals in history-related fields to think geographically about the past. ISBN: 9781589480131, 336 pp., $49.95. For more information about book availability or to place an order for Esri Press books, visit www.esri.com/esripress.